One trend to love this New Year that you can do yourself! Embellishments will be a huge trend this year especially the grungy 90’s style pins, patches and studs. No need to buy a new outfit to fit in with this trend just use your favorite worn in denim jacket and add you own patches or embellishments to add some personality to an old favorite. Better head to your favorite piercer, because the more piercings this year the better! 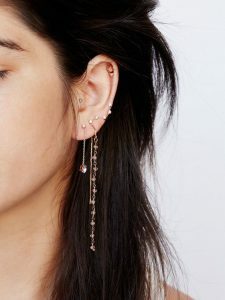 Multiple earrings will be a huge trend you will see this year that will have you dying for another piercing. Earring sets are an easy alternative to trying to mix and match a bunch of earrings up your ear. Sets often come with multiple cohesive options that can be mixed and matched. Don’t worry, if you aren’t so sure about heading to get another piercing, try some earring cuffs that don’t require a piercing. Nothing looks better with tons of earrings than high necklines. This is a trend that will soar all season and even into swimwear. 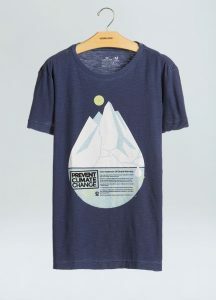 You are in luck because not only is this trend stylish, but it is extremely flattering for many body types. A high neckline on a simple casual shirt or dress will quickly add a ton of style to some of your old favorite styles. Back to the seventies, bell sleeves are in for 2017! This look is super trendy and encompasses that boho feel we all love. 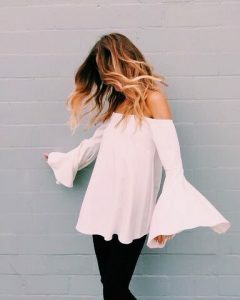 Look for bell sleeves in dresses and tops this year and they will quickly become one of your new favorite items in your wardrobe. Leaving you feeling free and flowy, don’t hesitate to show off those bell sleeves during a night out with a few twirls! Politics played a huge role on the trends leading up to 2017 and just because the election is over doesn’t mean the trends of politics in fashion are over. Throughout 2017 you are sure to see tons of political tees’s, whether you agree with them or not is a different story. But it’s 2017, and voicing your political views is on the rise and what better way to show how you stand on political issues than through your clothing. No more blisters on your heels…backless shoes are in! We especially love this trend because it’s quick and comfy. Look for slip on sandals this spring/summer and even backless cut outs on booties this winter and fall. This trend gives a casual cool vibe to your wardrobe that makes you look stylish without really trying. Denim will always be in style, stand out a little by getting some custom denim in your wardrobe. You will be able to find custom colors in washes in stores this year, or try some of the customization yourself. Distress and add color or embellishments at home to be sure your denim is one of a kind.